Going away? Need a place for your furry friend to stay? While we know you’d love to take them with you, Dal Acres West Kennels provides a relaxing, comfortable stay for your beloved pet while you’re away. Whether you’re leaving for the afternoon or for the week, we offer boarding and daycare services for customers in Springfield, IL and throughout the surrounding areas. As a family-owned business, we understand the attachment that people feel to their animals, and we’re here to help with a place that’s safe and sheltered for your cat or dog to await your arrival. Additionally, we’re a full-service groomer as well – call to talk with us about services or to schedule an appointment! Sunday 4:00 p.m. - 6:00 p.m.
Why Choose Dal Acres West? At Dal Acres, we truly care about your pet, and we want to do all that we can to make them, and you, feel comfortable throughout their stay. Read below for just a few of the reasons pet owners send their pets to Dal Acres West! Call our staff for details about any of our services or to schedule your pet’s appointment or stay with us. Voted Best in Springfield Six Times! Give your dog a vacation when you take a vacation with dog boarding services. Can you smell your dog from across the room? Time for a grooming session! Give your dog a safe place to go when nobody can be home! We provide a safe, relaxing environment for your feline friend. Prevent Fleas & Ticks with a seasonal medicated bath to ward off threats. Leave the always difficult job of bathing and grooming up to our pros! 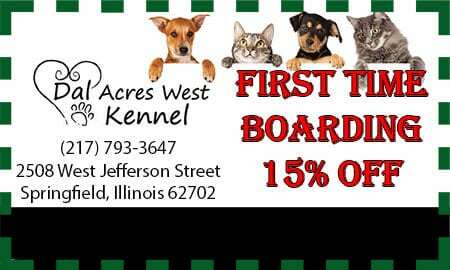 A great family owned, local business to board or groom your animals. They take great care of all my animals, every time they go. Very hard working, animal loving staff. They always go above and beyond to provide the best for your pets. The manger Selina who work at the front desk. Is very polite and very respectful towards and my furbabies she treat them like her own. The groomer is wonderful and listening to how I want my babies trimmed. As for the 2 kennels tech's they are the best people to have around your pets/babies. I never worry about them not being taking care of when they are there. Thank you very much to the staff . We love Dal Acres for our dog - both grooming and boarding. She is 14 years old and needs special food and meds. We have never had any problems. She acts like she really likes the people who care for her there. They have taken her last-minute for boarding a few times and they always seem very happy to have her and treat her like their own. Ready? Get started by calling our staff to schedule an appointment for grooming, or set up a stay for your cat or dog at our boarding and daycare facility. 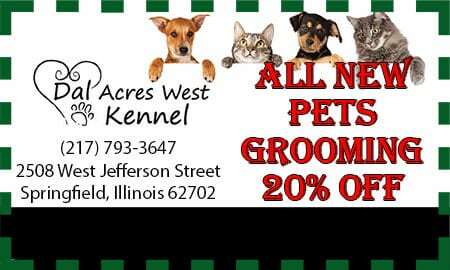 Located in, and serving the entire Greater Springfield, IL Area!